Preface. Outline of the Series. List of Contributors. Section 2A. Category Theory. Some aspects of categories in computer science (P.J. Scott). Algebra, categories, and databases (B. Plotkin). Section 2B. Homological Algebra. Cohomology. Cohomological Methods in Algebra. Homotopical Algebra. Homology for the algebras of analysis (A.Ya. Helemskii). Section 2D. Model Theoretic Algebra. Stable groups (F.O. Wagner). Section 3A. Commutative Rings and Algebras. Artin approximation (D. Popescu). Section 3B. Associative Rings and Algebras. Fixed rings and noncommutative invariant theory (V.K. Kharchenko). Modules with distributive submodule lattice (A.A. Tuganbaev). Serial and semidistributive modules and rings (A.A. Tuganbaev). Modules with the exchange property and exchange rings (A.A. Tuganbaev). Separable algebras (F. Van Oystaeyen). Section 3D. Deformation Theory of Rings and Algebras. Varieties of Lie algebra laws (Yu. Khakimdjanov). Section 4D. Varieties of Algebras, Groups, ... 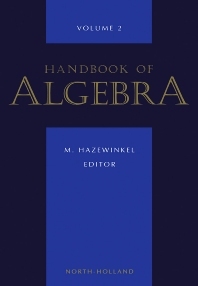 Varieties of algebras (V.A. Artamonov). Section 4E. Lie Algebras. Infinite-dimensional Lie superalgebras (Yu. Bahturin, A. Mikhalev, M. Zaicev). Nilpotent and solvable Lie algebras (M. Goze, Yu. Khakimdjanov). Section 5A. Groups and Semigroups. Infinite Abelian groups: Methods and results (A.V. Mikhalev, A.P. Mishina). Section 6C. Representation Theory of 'Continuous Groups' (Linear Algebraic Groups, Lie groups, Loop Groups, ...) and the Corresponding Algebras. Infinite-dimensional representations of the quantum algebras (A.U. Klimyk). Section 6D. Abstract and Functorial Representation Theory. Burnside rings (S. Bouc). A guide to Mackey Functors (P. Webb). Subject Index.